A non-smoking condo rental at this fabulous North Myrtle Beach resort is a great choice for groups and families. This quiet North Myrtle Beach resort has plenty to offer your water-loving family. Float around in the refreshing outdoor swimming pool at this popular resort in North Myrtle Beach, South Carolina. You and your family can relax by the swimming pool and work on that deep bronze hue that will tell everyone at the office you escaped to paradise. You can play with beach balls and listen to your favorite tunes while you and your family enjoy the outdoor swimming pool at this lovingly maintained resort in North Myrtle Beach, South Carolina. 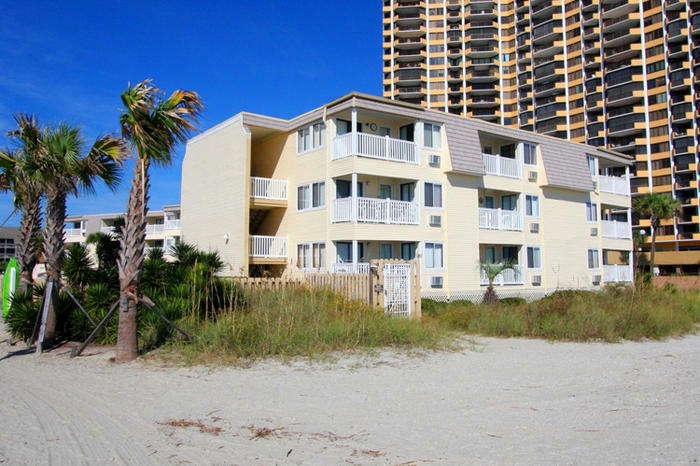 This private North Myrtle Beach resort has an excellent location near many other local areas of interest. A Place at the Beach VI sits right on the pristine beach putting you only steps away from the endless water of the majestic Atlantic Ocean. You can explore the shore and have countless hours of fun playing on the beach with your loving family. This trendy North Myrtle Beach resort is the ideal place to stay if you want to relax on the beach, with a book in one hand and cool beverage in the other. You can sail high above the beach and get a glimpse of lovely North Myrtle Beach from high in the sky when you parasail near this unique resort in North Myrtle Beach, South Carolina. Fishing along the beach outside of this affordable North Myrtle Beach resort may be generously rewarded with sheepshead, whiting or other local fish that are plentiful throughout the area. If fishing is you favorite pastime, visit one of the piers near this oceanfront resort in North Myrtle Beach, South Carolina. There are several fishing piers close to this pleasing North Myrtle Beach resort. Some of the fishing piers near this resort have bait and tackle shops where you can find everything you need for a successful day of angling. Deep-sea fishing charters are another neat way to see the natural beauty of South Carolina while fishing with the family and there are plenty to choose from near your exclusive resort in North Myrtle Beach, South Carolina. There are so many sights to see when you vacation at A Place at the Beach VI in North Myrtle Beach, South Carolina. The area surrounding your inviting North Myrtle Beach resort is overflowing with interesting places to visit. There is an abundance of golf courses in the North Myrtle Beach area. Many of the golf courses near your attractive North Myrtle Beach condo rental feature public tee times, club rentals, pro shops and driving ranges. You can also count on many of the golf courses in the area near your amazing resort to feature other amenities such as restaurants, spas and swimming pools. Children of all ages enjoy the miniature golf courses that you can find throughout North Myrtle Beach, South Carolina. When you vacation at A Place at the Beach VI, you will be close to numerous miniature golf courses that are open during the day and evening hours. The miniature golf courses that are close to your peaceful North Myrtle Beach resort have a wide array of themes and exciting features. When you and your family stay in a welcoming condo rental at this North Myrtle Beach resort, you can putt-putt your way through a mystical cave full of the hidden treasures that pirates have sailed the seas for or get a hole-in-one next to a towering dinosaur or a smoking volcano. Whichever North Myrtle Beach miniature golf course you choose, you and your family are sure to have fun and make memories that will last a lifetime.